Giant vesicles containing highly packed micrometer-sized components are useful cell models. The water-in-oil emulsion centrifugation method is a simple, powerful tool for the preparation of giant vesicles with encapsulated materials. 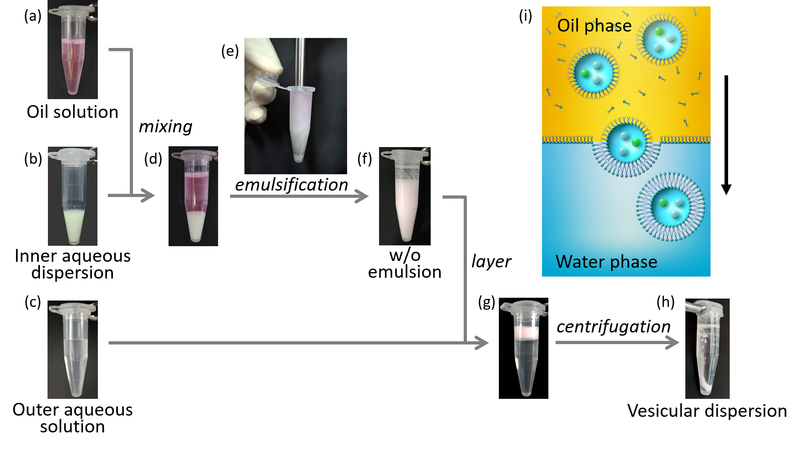 Natsume, Y., Wen, H. i., Zhu, T., Itoh, K., Sheng, L., Kurihara, K. Preparation of Giant Vesicles Encapsulating Microspheres by Centrifugation of a Water-in-oil Emulsion. J. Vis. Exp. (119), e55282, doi:10.3791/55282 (2017). The constructive biology and the synthetic biology approach to creating artificial life involve the bottom-up assembly of biological or nonbiological materials. 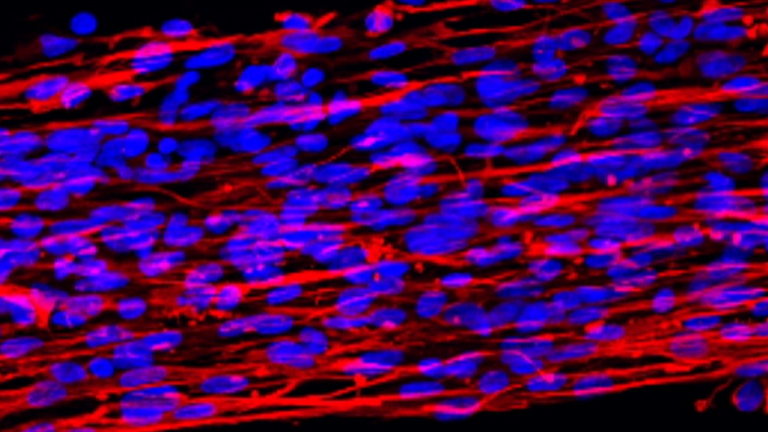 Such approaches have received considerable attention in research on the boundary between living and nonliving matter and have been used to construct artificial cells over the past two decades. In particular, Giant Vesicles (GVs) have often been used as artificial cell membranes. In this paper, we describe the preparation of GVs encapsulating highly packed microspheres as a model of cells containing highly condensed biomolecules. The GVs were prepared by means of a simple water-in-oil emulsion centrifugation method. Specifically, a homogenizer was used to emulsify an aqueous solution containing the materials to be encapsulated and an oil containing dissolved phospholipids, and the resulting emulsion was layered carefully on the surface of another aqueous solution. The layered system was then centrifuged to generate the GVs. This powerful method was used to encapsulate materials ranging from small molecules to microspheres. The constructive, or synthetic, biology approach is a fascinating avenue for exploring the boundary between living and nonliving matter. Because the cell is the minimum unit required for life as we currently understand it, various researchers have attempted to construct artificial cells from simple, well-understood chemicals so that phenomena that occur within such artificial cells can be studied, with the ultimate goal of elucidating the origins of life and studying the fundamental functions of living cells1,2,3. In particular, vesicles4, which are spherical microcompartments made of amphiphilic molecules and can encapsulate biological molecules such as proteins5,6 and DNA7,8,9,10, have often been used as models of biological membranes. Vesicles can be classified as small (defined as having a diameter of <100 nm), large (diameter <1 µm), or giant (diameter >1 µm). Giant vesicles (GVs) have been studied extensively because they are similar to living cells in size, shape, and structure. Owing to the size of GVs, morphological changes in GV membranes can easily be observed in real time under an optical microscope. Several methods for preparing GVs have been reported11, including the hydration method12,13, the freeze-thaw method14, the electroformation method15,16, and the fluidic device method17,18. However, encapsulating proteins and other macromolecules in GVs at high concentrations by means of these methods is difficult. In particular, it is extremely challenging to encapsulate biological materials in sufficient quantity (20-30 vol%) to mimic the crowded environment inside cells19,20. To form GVs instantly, Weitz and coworkers established a water-in-oil (w/o) emulsion centrifugation method21,22. This method has five important features. First, because GVs prepared by this method have low lamellarity23,24, their membranes are so thin that they can be deformed easily. GV membrane deformation induced by FtsZ (a bacterial cell division protein), tubulin, and other macromolecules has been studied25,26,27,28, and we observed polyhedron-like deformation of GV membranes induced by encapsulation of microspheres29,30. Second,membrane proteins can be inserted into the vesicular membrane by this method, albeit with difficulty31. For example, the Yomo group used this method to study the in vitro synthesis and pore-forming activity of the membrane protein α-hemolysin32. Third, it is possible to generate asymmetric GVs in which the lipid components of the inner and outer leaflets are different22. For example, Whittenton et al. generated asymmetric GVs with cationic lipids in the inner leaflet to encapsulate negatively charged polynucleotides, and with neutral lipids on the outer leaflet to decrease toxicity and nonspecific cellular uptake33. Fourth, the concentration and volume fraction of substances inside the GVs can be relatively high28,34. Fifth, multiple types of materials can be encapsulated35. For example, Nishimura et al. encapsulated an in vitro transcription-translation system into GVs and used the system to express green fluorescent protein (GFP) within the GVs36. These five features make w/o emulsion centrifugation an indispensable method for generating cell-mimicking GVs. In previous work, GVs generated by centrifugation were collected by means of a syringe equipped with a long 16 G stainless steel needle containing some of the final aqueous solution22. In the hands of inexperienced technicians, this collection method could easily result in contamination of the GV with some of the oil. In this study, we used the w/o emulsion centrifugation protocol developed by the Yomo group23,37, in which precipitated GVs are collected through a hole opened at the bottom of the centrifuge tube in which they are prepared. We prepared GVs encapsulating 1.0 µm microspheres, which are similar in size to intracellular organelles. The use of microspheres allowed us to estimate their concentration by calculating their volume fraction. Establishment of a method for preparation of GVs in which materials are densely packed is an important step for creating artificial cells. To confirm the utility of our protocol for various types of inner materials, we also demonstrated that GFP and a small water-soluble fluorescent molecule (uranine) could be encapsulated in the GVs. Prepare a stock solution of 1,2-dioleoyl-sn-glycero-3-phosphocholine (DOPC, 25 mM) and a stock solution of Texas Red 1,2-dihexadecanoyl-sn-glycero-3-phosphoethanolamine, triethylammonium salt (Texas Red DHPE, 0.20 mM) in chloroform and store the stock solutions at -20 °C. Form a lipid film on the inside surface of a 5 ml glass vial by evaporating a mixture of the DOPC stock solution (51.0 µl and the Texas Red DHPE stock solution (19.2 µl) under flowing nitrogen gas. Incubate the film under reduced pressure overnight and then add 1.0 ml of liquid paraffin (0.86-0.89 g/cm3) to the vial. Wrap the vial in aluminum foil and incubate it at 80 °C O/N at rest. The final concentrations of DOPC and Texas Red DHPE are 1.3 and 3.8 x 10−3 mM, respectively, and the DOPC:Texas Red DHPE molar ratio is 100:0.3. Prepare the inner aqueous dispersion. In a 1.5 ml lidded microtube, mix 237.5 µl of a dispersion of 1.0 µm nonfluorescent microspheres (2.5 vol%) and 12.5 µl of a dispersion of 1.0 µm fluorescent microspheres (2.5 vol%); this corresponds to a 95:5 (v/v) ratio of nonfluorescent to fluorescent microspheres. Add 64 mg of sucrose followed by 125 µl of Tris-buffered solution (TBS, 1 M) and 875 µl of deionized water. The final volume fraction of microspheres is 0.5 vol%, and the final concentrations of Tris-HCl (pH 7.5) and sucrose are 0.1 and 0.15 M, respectively. Vortex the microtube for 30 sec and then sonicate it for 10 min. Prepare the outer aqueous solution. After preparation of 10 ml of a Tris-buffered solution (0.1 M Tris-HCl [pH 7.5], 0.15 M glucose) in the same procedure as inner aqueous media, place 1 ml of the solution in a 1.5 ml lidded microtube. Vortex the microtube for 30 sec and then sonicate it for 10 min. Prepare a w/o emulsion containing microspheres. Mix 1 ml of the oil solution (liquid paraffin containing DOPC and Texas Red DHPE) with 300 µl of the inner aqueous solution in a 1.5 ml microtube. Emulsify the two components in the microtube by using a mechanical homogenizer (an agitator with blades that rotate at high speed) operated at 10,000 rpm for 2 min at RT. Gently layer 300 µl of the w/o emulsion on the upper surface of 1 ml of the outer aqueous solution at 4 °C in a 1.5 ml lidded microtube. Chill the microtube for 10 min at 4 °C. Immediately after chilling the microtube, centrifuge it at 18,000 x g for 30 min. Obtain the precipitated GVs by piercing the bottom of the microtube with a pushpin and collecting one droplet in a sterilized 1.5 ml microtube. Dilute the precipitated GV droplet 10-100 fold by volume with the outer aqueous solution if the obtained GVs are obtained in quantities large enough to make observation difficult. Place an adhesive incubation chamber for in situ polymerase chain reaction and hybridization (chamber size 9 mm x 9 mm x 0.3 mm thick) on top of a microscope cover glass. Using a micropipette, deposit 25 µl of the diluted precipitated GVs on the specimen area and immediately place another cover glass (approximately 0.15 mm thick) on top of the incubation chamber. Record differential interference contrast microscopy images of the GVs. Record microscopy images of the vesicles with a microscope (10X, 20X, and 40X objectives) equipped with a 12V100WHAL-L halogen lamp. Insert U-FBNA and U-FMCHE fluorescence mirror units into the microscope. Fit the units with 470-495 nm and 565-585 nm excitation filters, respectively, and with emission filters that transmit 510-550 nm and 600-690 nm light, respectively. The w/o emulsion centrifugation method is illustrated photographically and schematically in Figure 1. The schematic image in Figure 1 suggests that the most important determinant of the success of this method is that the specific gravity of the inner aqueous solution must be larger than that of the outer aqueous solution, so that the GVs will precipitate during centrifugation. In addition, the formation of a lipid monolayer at the w/o interface requires that the system be chilled for 10 min after the emulsion is layered on the outer aqueous solution. Because the GVs form by transfer of emulsion droplets across the w/o interface, the osmotic pressures in the inner and outer aqueous layers must be the same. As a control experiment, we also prepared GVs containing no microspheres by means of the process shown in Figure 1 and step 1.3, except that the inner aqueous solution was prepared without microspheres. Collection of the precipitated GVs after centrifugation is shown in Figure 2. In addition to the semitransparent phase at the very bottom of the microtube, we also observed a white, turbid intermediate phase in the outer aqueous solution (Figure 2a). This intermediate phase was rich in aggregations of microspheres and oil, whereas the bottom phase contained the GVs. Therefore, after piercing the bottom of the microtube with a pushpin (Figure 2b), we collected only the first drop (Figure 2c), which contained massive amounts of GVs. It is important to make sure that no more than two drops are collected; any additional drops may contain aggregations of microspheres and lipids, which will result in a lower density of GVs. The obtained vesicular dispersion often contained encapsulated materials outside of the GVs because the GVs often rupture during centrifugation. To obtain only GVs, a sorting method such as dialysis, gel filtration, or fluorescence-activated cell sorting should be chosen, owing to the sizes of the encapsulating materials. If necessary for the purpose for which the precipitated GVs are to be used, they can be diluted with the outer aqueous solution. In some cases, the intermediate phase extended to the bottom of the tube, suggesting that any vesicles that formed were held together by the oil. 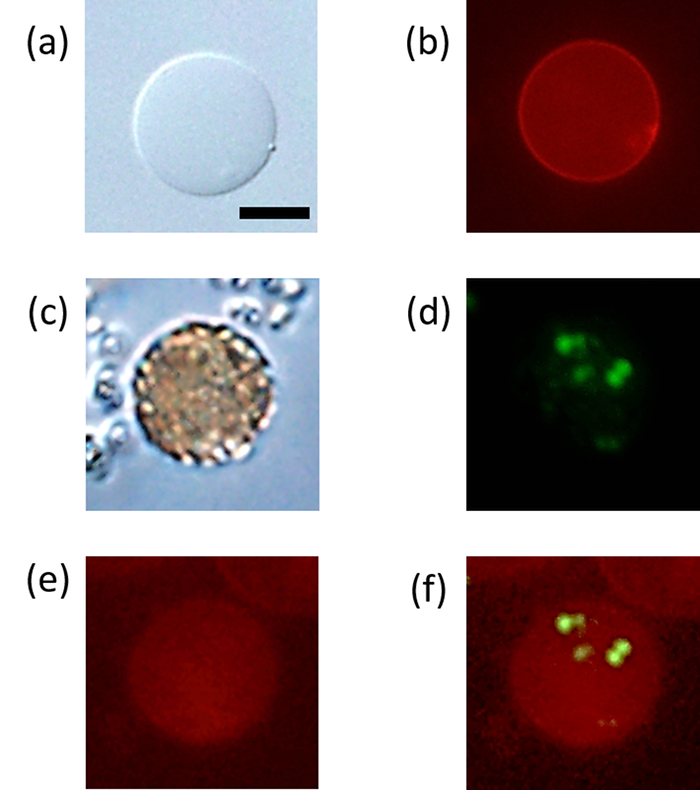 We obtained differential interference microscopy and fluorescence microscopy images of the GVs without microspheres (Figure 3a, 3b) and with microspheres (Figure 3c-3f). Consistent with previous reports23,37, GVs with low lamellarity were formed by our protocol. Lipids conjugated with Texas Red DHPE, which emits red fluorescence, were used so that vesicle formation could be directly confirmed by visualization of the thin membrane. Of the 160 GVs that we obtained, 55 encapsulated microspheres and 105 were empty, giving a ratio of encapsulation of 34%. We determined the volume fraction (φ, vol %) of microspheres in the GVs by means of the following method. Because each GV contains dozens to several hundred microspheres, counting all the microspheres under an optical microscope is challenging. Therefore, we mixed the nonfluorescent 1.0 µm microspheres with a small amount of fluorescent microspheres, which were manually counted under the fluorescence microscope. The total number (N) of encapsulated microspheres was calculated by multiplying the number (n) of manually counted fluorescent microspheres by 20 (based on the original 95:5 [v/v] ratio of nonfluorescent to fluorescent microspheres). The value of φ was then estimated as Nv100/V, where v is the volume of the microspheres and V is the volume of the individual GV. Note that estimation of N from n gives rise to counting errors, and these errors must be taken into account when calculating φ. The value of φ was estimated from N, which was directly calculated as 20n, and this in turn resulted in the probability that φ accurately represents the true value is <50%. In fact, N fluctuates to some extent around 20n, so we need to consider it as 20(n ±i), where i is the error in n. We estimated i in order that a probability of n ±i could be more than 50% obtained on the basis of a Poisson distribution. We estimated i, which in turn allowed us to calculate 20(n ± i) and values of φ that included counting errors for GVs with diameters of 10 and 15 µm (Table 1). According to this procedure, the volume fraction of microspheres in the GV shown in Figure 3c was estimated to be 11 ±3 vol %. The precision of the calculated volume fraction was 10-30%. Our results indicate that we successfully encapsulated 1 μm microspheres in GVs at a high volume fraction. We were also able to encapsulate other materials into 100 mol % DOPC GVs using the same outer aqueous solution and the same protocol (Figure 4). Specifically, GVs containing 0.1 µm microspheres were prepared from a Tris-buffered solution containing 0.1 M Tris-HCl (pH 7.5), 0.15 M sucrose, and 0.5 vol % fluorescent microspheres by means of the protocol described for GVs containing 1.0-µm microspheres (Figure 4a). Following the protocol described above, DOPC GVs containing GFP (0.1 M Tris-HCl [pH 7.5], 0.15 M sucrose, and 100 µg/mL GFP; Figure 4b) and GVs containing uranine (0.1 M Tris-HCl [pH 7.5], 0.15 M sucrose, and 30 µM uranine; Figure 4c) were also prepared. a Errors were determined as described in the text; n = number of manually counted microspheres; N = total number of encapsulated microspheres. Table 1: Numbers and Volume Fractions (φ, vol%) of Microspheresa. a Errors were determined as described in the text; n = number of manually counted microspheres; N = total number of encapsulated microspheres. Figure 1: Flow Chart and Schematic Depiction of W/O Emulsion Centrifugation Method. (a) Oil solution consisting of DOPC and Texas Red DHPE (100:0.3 molar ratio) in liquid paraffin. (b) Inner aqueous dispersion consisting of sucrose and microspheres in Tris-HCl buffer. (c) Outer aqueous solution consisting of glucose in Tris-HCl buffer. (d) Mixture of 1 ml of oil solution and 300 µl of inner aqueous dispersion. (e) Emulsification with a homogenizer (10,000 rpm, 2 min). (f) The w/o emulsion. (g) Layering of 300 µl of the emulsion on 1 ml of the outer aqueous solution. (h) Precipitated GVs just after centrifugation. (i) Schematic depiction of the principle of the w/o emulsion centrifugation method. The black arrow indicates the direction of centrifugal acceleration. Please click here to view a larger version of this figure. Figure 2: Piercing of the Microtube. (a) Precipitated GVs just after centrifugation (also depicted in Figure 1h). The red ellipse indicates the droplet of the precipitated GV dispersion. (b) Piercing of the microtube with a pushpin. The pellet containing the GVs was obtained by piercing the microtube near the bottom with a pushpin and collecting droplets from the hole. (c) Droplet of the precipitated GVs (indicated by the yellow arrow) dispersion diluted with the outer aqueous solution. Please click here to view a larger version of this figure. Figure 3: Microscopy Images of GVs. (a) Differential interference contrast microscopy image of a GV without microspheres. The diameter of GV was about 10 µm. Scale bar = 10 µm. (b) Fluorescence microscopy image of a GV without microspheres. The red fluorescence was emitted by Texas Red DHPE. (c) Differential interference contrast microscopy image of a GV containing microspheres. (d) Fluorescence microscopy image of 1.0 µm microspheres (YG carboxylate microspheres) inside a GV. The number of counted fluorescent microspheres (n) was 6. We estimated the errors (i = 2) based on Poisson distribution. Then we estimated total number of inner microspheres (N = 20 (n ±i)) was 120 ±40. It was calculated that the GV contained 1.0 µm microspheres at a volume fraction (φ = Nv100/V) of approximately 11 ± 3 vol%, where v is the volume of the microspheres and V is the volume of the GVs. (e) Fluorescence microscopy image of a GV membrane. The red fluorescence was emitted by Texas Red DHPE. (f) Merged image of the images in panels d and e. Please click here to view a larger version of this figure. Figure 4: Differential Interference Contrast and Fluorescence Microscopy Images of GVs with Different Encapsulated Materials. Differential interference contrast microscopy (top) and fluorescence microscopy (bottom) images of GVs containing (a) 0.1 µm microspheres, (b) GFP, and (c) uranine. Scale bars = 10 µm. Please click here to view a larger version of this figure. The specific gravities of the inner aqueous dispersion medium and the outer aqueous solution must be chosen carefully. For the w/o emulsion to precipitate into the outer aqueous solution during centrifugation, the specific gravity of the inner aqueous dispersion medium must be larger than that of the outer aqueous solution. We tried to prepare GVs using inner and outer solutions without sugars, but we obtained no GVs under these conditions, because the inner aqueous solution did not have enough mass to cross the interference between the two phases. If there is a large osmotic pressure difference between the two solutions, GVs that precipitate into the outer aqueous solution may shrink or rupture. Therefore, the osmotic pressure inside and outside the GVs must be equal. To accomplish this, we used sucrose as a solute in the inner aqueous dispersion and glucose as a solute in the outer aqueous solution; both sugars were at the same concentration. Both salt22 and sugar23,35,38 have been used for such purposes, but sugar is usually employed because it is less toxic and more soluble than salt. However, if too much sugar is added, the GVs may come into contact with the bottom of the cover glass and collapse. There are several strategies for avoiding this. One strategy is to reduce the specific gravity difference between the inner and outer aqueous solutions so that the GVs precipitate under mild conditions; specifically, the supernatant of the precipitated GV dispersion can be exchanged with a solution that is identical to the inner aqueous solution to reduce the possibility of vesicular rupture by adhesion to the cover glass as a result of buoyancy. Another strategy is to precoat both of cover glasses with a thin lipid film29. Proper preparation and incubation of the emulsion are important. We used liquid paraffin to prepare the oil solution. Mineral oil26,31, dodecane21,33, and squalane33,39 are also often used as solvent oils. Because these materials vary in specific gravity, viscosity, and surface tension, different numbers of vesicles form even when the same centrifugation conditions are used33. To obtain the vesicles with the target properties, it is essential to optimize the specific gravities and viscosities of the inner and outer aqueous solutions as well as the centrifugal acceleration.For preparation of the oil phase, incubation must occur at high temperature and in a dry environment such as an incubator or a dehydrator. In this study, we heated the liquid paraffin to 80 °C to completely dissolve the lipid molecules.In addition, the emulsion should be prepared only as needed and should be immediately subjected to centrifugation because it is unstable just after it is prepared and the w/o droplets readily fuse to one another. The emulsion can be prepared in large quantities by sonication, vortexing, or tapping. However, using a homogenizer allows for rapid preparation of large amounts of emulsion and easier emulsification in oil with a high viscosity. It is also important that the emulsion be layered on the outer aqueous solution gently and rapidly and then chilled at 4 °C. To shorten the time between emulsification and centrifugation, the oil-outer aqueous solution system can be prechilled before the emulsion is layered on it, and the whole system can then be centrifuged immediately.If the white turbidity appears faster or slower than usual, the mechanical homogenizer must be thoroughly rinsed to remove cleaning detergents. In addition, before emulsification, the oil solution, inner aqueous solution, and emulsifier must be returned to room temperature. Proper centrifugal acceleration is also important. By centrifuging at 18,000 x g, we were able to prepare GVs with a single interior material encapsulated at a high concentration. When the encapsulation of multiple materials is required, it is better to reduce the centrifugal acceleration. For example, an actin assembly system encapsulating seven compounds was achieved with centrifugation at less than 350 x g35. In cases in which centrifugation is undesirable, GVs can be obtained by adjusting the sugar concentration or by precipitating the emulsion under the influence of its own mass38,40,41. The method reported herein has two major limitations. One is that oil molecules (paraffin, in this case) can be solubilized in the GV membrane, as has been pointed out by the Weitz group21. When insertion of a membrane protein into the GV membrane is desired, the effects of co-existing oil molecules on the protein must be considered. The other limitation is the variation of volume fraction. In this study, we estimated that the volume fractions of microspheres in the GVs ranged from 4-30 vol%; the volume fractions were not identical to the volume fraction of the inner aqueous solution used for GV preparation. Although we were able to encapsulate microspheres in the GVs at a volume fraction high enough for microscopy observation, this method is not suitable for the preparation of GVs with a uniform volume fraction distribution. It has been reported that the distribution of microsphere volume fractions changes during centrifugation34. The w/o emulsion centrifugation method is commonly used for the formation of GVs containing encapsulated materials. However, few reports have described the preparation of GVs encapsulating microscale materials34,42. Recently, molecular robots containing an encapsulated DNA device or a molecular device have been constructed43,44. GVs with compartments are the first choice for these kinds of applications; therefore, techniques, such as ours, that could be used for encapsulating magnetic microspheres and microspheres with diverse surface functionalization can be expected to be useful44. We thank Tomoko Yamaguchi for drawing the schematic image in Figure 1. This study was supported by the Okazaki ORION Project of the Okazaki Institute for Integrative Bioscience of theNational Institutes of Natural Sciences (NINS); by the Astrobiology Center Project (no. AB281010) of NINS; by a Grant-in-Aid for Scientific Research on Innovative Areas (Dynamical ordering of biomolecular systems for creation of integrated functions) (no. 25102008) from the Japan Society for the Promotion of Science (JSPS); by a Grant-in-Aid for Young Scientists (B) (to K.K., no. 15K17850) from JSPS; andby a Grant-in-Aid for Research Activity Start-Up (to Y.N., no. 15H06653) from JSPS. Additional support was provided by a grant from the Noguchi Institute, a grant from the Kao Foundation for Arts and Sciences, and a grant from the Kurita Water and Environment Foundation. Microman E Gilson FD10006 Pipette for viscous liquid. We measured liquid paraffin by using this. Luisi, P. L. The emergence of life: from chemical origins to synthetic biology. Cambridge University Press. (2006). Luisi, P. L., Stano, P. The minimal cell: the biophysics of cell compartment and the origin of cell. Springer. (2011). Rasmussen, S., et al. Protocells: Bridging nonliving and living matter. The MIT Press. (2008). Luisi, P. L., Walde, P. Giant vesicles: perspectives in supramolecular chemistry. Wiley-Interscience. (2000). Kita, H., et al. Replication of genetic information with self-encoded replicase in liposomes. Chem Bio Chem. 9, (15), 2403-2410 (2008). Nomura, S. M., et al. Gene expression within cell-sized lipid vesicles. Chem Bio Chem. 4, (11), 1172-1175 (2003). Oberholzer, T., Albrizio, M., Luisi, P. L. Polymerase chain reaction in liposome. Chem Biol. 2, (10), 677-682 (1995). Shohda, K., et al. Compartment size dependence of performance of polymerase chain reaction inside giant vesicle. Soft Matter. 7, (8), 3750-3753 (2011). Kurihara, K., et al. Self-reproduction of supramolecular giant vesicles combined with the amplification of encapsulated DNA. Nat Chem. 3, (10), 775-781 (2011). Kurihara, K., et al. A recursive vesicle-based model protocell with a primitive model cell cycle. Nat Comm. 6, 8352 (2015). Walde, P., Cosentino, K., Engel, H., Stano, P. Giant vesicles: preparations and applications. Chem Bio Chem. 11, (7), 848-865 (2010). Reeves, J. P., Dowben, R. M. Formation and properties of thin-walled phospholipid Vesicles. J Cell Physiol. 73, (1), 49-60 (1969). Needham, D., Evans, E. Structure and mechanical properties of giant lipid (DMPC) vesicle bilayers from 20 °C below to 10 °C above the liquid crystal-crystalline phase transition at 24 °C. Biochemistry. 27, (21), 8261-8269 (1988). Oku, N., MacDonald, R. C. Differential effects of alkali metal chlorides on formation of giant liposomes by freezing and thawing and by dialysis. Biochemistry. 22, (4), 855-863 (1983). Angelova, M. I., Dimitrov, D. S. Liposome electroformation. Far Disc Chem Soc. 81, 303-311 (1986). Dimitrov, D. S., Angelova, M. I. Lipid swelling and liposome formation on solid surfaces in external electric fields. New Trends Coll Sci. 73, 48-56 (1987). Funakoshi, K., Suzuki, H., Takeuchi, S. Formation of giant lipid vesicle like compartments from a planar lipid membrane by a pulsed jet flow. J Am Chem Soc. 129, (42), 12608-12609 (2007). Stachowiak, J. C., et al. Unilamellar vesicle formation and encapsulation by microfluidic jetting. Proc Natl Acad Sci USA. 105, (12), 4697-4702 (2008). Ellis, R. J. Macromolecular crowding: obvious but underappreciated. Trends Biochem Sci. 26, (10), 597-604 (2001). Ellis, R. J., Minton, A. P. Cell biology: join the crowd. Nature. 425, (6953), 27-28 (2003). Pautot, S., Frisken, B. J., Weitz, D. A. Production of unilamellar vesicles using an inverted emulsion. Langmuir. 19, (7), 2870-2879 (2003). Pautot, S., Frisken, B. J., Weitz, D. A. Engineering asymmetric vesicles. Proc Natl Acad Sci USA. 100, (19), 10718-10721 (2003). Nishimura, K., et al. Population analysis of structural properties of giant liposomes by flow cytometry. Langmuir. 25, (18), 10439-10443 (2009). Chiba, M., Miyazaki, M., Ishiwata, S. Quantitative analysis of the lamellarity of giant liposomes prepared by the inverted emulsion method. Biophys J. 107, (2), 346-354 (2014). Cabré, E. J., et al. Bacterial division proteins FtsZ and ZipA induce vesicle shrinkage and cell membrane invagination. J Biol Chem. 288, 26625-26634 (2013). Osawa, M., Erickson, H. P. Liposome division by a simple bacterial division machinery. Proc Natl Acad Sci USA. 110, (27), 11000-11004 (2013). Hayashi, M., et al. Reversible morphological control of tubulin-encapsulating giant liposomes by hydrostatic pressure. Langmuir. 32, (15), 3794-3802 (2016). Terasawa, H., Nishimura, K., Suzuki, H., Matsuura, T., Yomo, T. Coupling of the fusion and budding of giant phospholipid vesicles containing macromolecules. Proc Natl Acad Sci USA. 109, (16), 5942-5947 (2012). Natsume, Y., Toyota, T. Asymmetrical polyhedral configuration of giant vesicles induced by orderly array of encapsulated colloidal particles. PLOS ONE. 11, (1), e0146683 (2016). Natsume, Y., Toyota, T. Appearance of crystalline pattern for colloidal particles encapsulated in giant vesicles: direct cross-sectional observation of ordered and disordered phases. Trans Mater Res Soc Jpn. 41, (2), 147-149 (2016). Noireaux, V., Libchaber, A. A vesicle bioreactor as a step toward an artificial cell assembly. Proc Natl Acad Sci USA. 101, (51), 17669-17674 (2004). Fujii, S., Matsuura, T., Sunami, T., Kazuta, Y., Yomo, T. In vitro evolution of α-hemolysin using a liposome display. Proc Natl Acad Sci USA. 110, (42), 16796-16801 (2013). Whittenton, J., et al. Evaluation of asymmetric liposomal nanoparticles for encapsulation of polynucleotides. Langmuir. 24, (16), 8533-8540 (2008). Natsume, Y., Toyota, T. Giant vesicles containing microspheres with high volume fraction prepared by water-in-oil emulsion centrifugation. Chem Lett. 42, (3), 295-297 (2013). Pontani, L. L., et al. Reconstitution of an actin cortex inside a liposome. Biophys J. 96, (1), 192-198 (2009). Nishimura, K., et al. Cell-free protein synthesis inside giant unilamellar vesicles analyzed by flow cytometry. Langmuir. 28, (22), 8426-8432 (2012). Fujii, S., Matsuura, T., Sunami, T., Nishikawa, T., Kazuta, Y., Yomo, T. Liposome display for in vitro selection and evolution of membrane proteins. Nat Protoco. 9, (7), 1578-1591 (2014). Hamada, T., et al. Construction of asymmetric cell-sized lipid vesicles from lipid-coated water-in-oil microdroplets. J Phys Chem B. 112, (47), 14678-14681 (2008). Levine, R. M., Pearce, T. R., Adil, M., Kokkoli, E. Preparation and characterization of liposome-encapsulated plasmid DNA for gene delivery. Langmuir. 29, (29), 9208-9215 (2013). Saito, H., et al. Time-resolved tracking of a minimum gene expression system reconstituted in giant liposomes. ChemBioChem. 10, (10), 1640-1643 (2009). Yanagisawa, M., Iwamoto, M., Kato, A., Yoshikawa, K., Oiki, S. Oriented reconstitution of a membrane protein in a giant unilamellar vesicle: experimental verification with the potassium channel KcsA. J Am Chem Soc. 133, (30), 11774-11779 (2011). Saito, A. C., Ogura, T., Fujiwara, K., Murata, S., Nomura, S. M. Introducing micrometer-sized artificial objects into live cells: a method for cell-giant unilamellar vesicle electrofusion. PLOS ONE. 9, (9), e106853 (2014). Murata, S., Konagaya, A., Kobayashi, S., Saito, H., Hagiya, M. Molecular robotics: a new paradigm for artifacts. New Gener Comput. 31, (1), 27-45 (2013). Hagiya, M., Konagaya, A., Kobayashi, S., Saito, H., Murata, S. Molecular robots with sensors and intelligence. Acc Chem Res. 47, (6), 1681-1690 (2014). The video material is nice and useful, but I consider disturbing the initial part of the protocol where the lipid solution in chloroform are handled: the lipids dissolved in chloroform are transferred for drying using a PLASTIC TIP. This has two major drawbacks. First, chloroform dissolves plastic material and no matter how fast the transfer is, one has the danger of contaminating the lipid sample (glass syringes should be used instead). Second, because of the high vapor pressure of chloroform, measuring the exact volume of the lipid mixture with a pipette will be jeopardized (which is important when aiming at preparing lipid membrane with certain composition). In summary, I strongly advise against pipetting lipids in chloroform solutions with plastic tips and would recommend the use of glass syringes.